This is an excellent condition 4Runner ready for your next adventure. This is a clean 4 Runner with no accidents and a clean vehicle history report. Features on this SR5 include front row power cloth bucket seats AM/FM/CD and Sirius XM satellite radio (with activation) back up camera Bluetooth Navigation Sunroof power windows power mirrors with heat power locks air conditioning alloy wheels ABS brakes AUX audio jack cruise control electronic parking aid (sonar) Fog/driving lights front and side SRS airbags interval wipers keyless entry leather wrapped steering wheel with controls rear defrost rear spoiler rear wiper second row folding seat tilt/telescoping steering column tinted windows tow package traction control universal garage door opener and much more. The exterior of this 4Runner features Toyota's Blizzard Pearl clear coat finish with a Sand Beige cloth interior. Power comes from a 4.0L V6 engine paired with a 6-speed automatic transmission. We are a full service dealer with a straight forward approach to your used SUV buying experience. 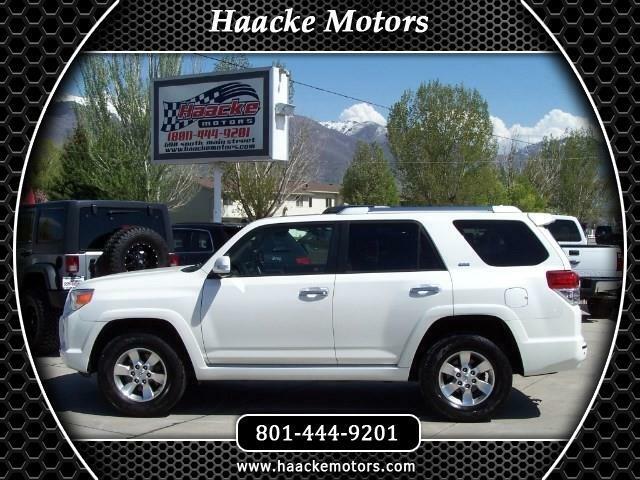 We also offer a variety of aftermarket accessories for your car truck or SUV.See us on our websiteat www.haackemotors.com AutoTrader.com Cars.com Carsforsale.com KSL.comCargurus.com Facebook and Instagram!